Happy spring, everyone! And with that, happy shedding season! For some of you though, it may not be so happy. I know for me I dread this time because my allergies flare up, there’s hair everywhere and no matter how hard I try it just never seems to end. It seems like for me, my horse has one week in the spring that is just the worst! His hair is falling out literally by the handful for that entire week. After that he still sheds, but not in that amount. In this blog I am going to share with you some tips, tricks, and products I use to get me through the awful week and beyond. 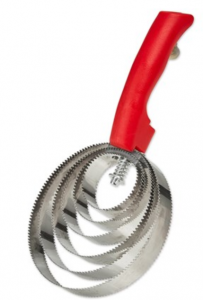 The first tool I have, which I’ve owned forever and could never live without, is the spiral curry comb. Some also call it a metal curry comb, but either way gets the job done! This comb is a round, rugged piece of metal that really gets deep down in the coat to pull up loose hair, dirt, and even helps get out the dried mud. Since it is metal, you must be a little careful with the amount of pressure you apply. Sometimes I can see my horse flinch or get antsy when I use it because I’m pushing too hard and getting his skin. But it is phenomenal at getting clumps of hair out a time. I mainly use this on the main part of his body including his neck, back and stomach area, while trying to avoid sensitive areas. Overall great product for tough dried on mud and if you have a horse like mine that sheds out all at once, it gets a mass amount of hair off! 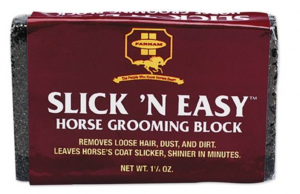 The next item in my tack box is the Slick N Easy product. This kind of reminds me a of loofa, as it’s a coarse fiberglass block that can be used multiple times. Again, like the spiral curry, it is rough, so you have to be a little gentle but does not seem to bother my horse as much. The Slick N Easy is relatively small and has no handle, so it fits in the palm of my hand perfectly. I mostly use this in the smaller areas like the top of his hips, gaskins, chest and the back of his legs or in between the tail. 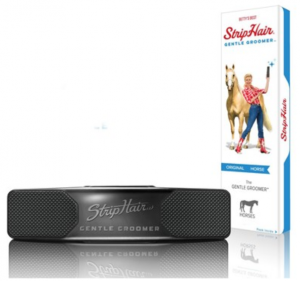 Another product I use interchangeably with this one is the original StripHair rubber. I do this because they are both similar in size, weight, and usability. The only time I prefer to use the StripHair over the block is when I am bathing or when I feel like my guy’s skin is being extra sensitive. He does not seem to mind the rubber at all so towards the end of the mass shedding week I like the rubber. Also, during bath time, the rubber is easy to use to get water and shampoo out of the coat, similar to a sweat scrapper, while still getting out the loose/excess hair. Both are great products and always keep both on hand! The last item I could never live without during shed season is the HandsOn gloves. This product is amazing! I like to use it during all stages of the shed process, and all over his body. These gloves are amazing as keeping my hands clean while really getting into the dirt and nastiness of his coat. Each finger tip even has their own scrubbing nodules on the tips, so it even allows me to scrub down around his knees, pastern, and hard to get grooves of the body. I use this product during baths as well, which allows me to scrub in the soap deep into the coat. 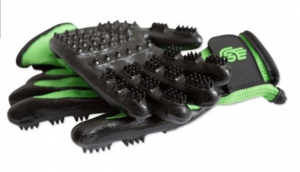 It’s a really fun product actually because you put the gloves on and basically just start petting your horse all over which is great bonding time too! Overall, all these products I have mentioned serve different purposes during the shedding process. I keep all of them on hand through out the entire year to make our grooming experience easier and cleaner. They each play a big part in our shedding season, so if you feel like you (or your horse really) could benefit from of these, visit our website and get yours today!